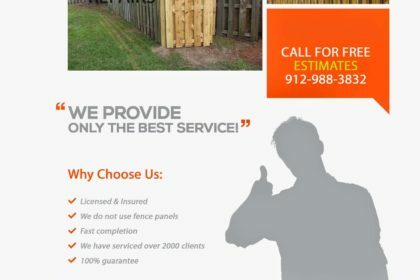 Looking for a Fence Contractor Savannah GA? 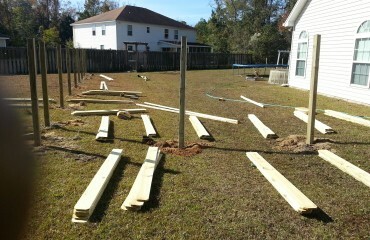 Chatham Property Maintenance Fence Contractor Savannah GA provides professional fence installation. With the many fencing contractors in the Savannah area, we have worked to separate our company from other fence installers. We are dedicated to providing both residential and commercial fence services. No matter the size of your fence project we are able to provide you with the fence services you are looking for. If you are simply looking for privacy and security or you would like a fence to stand out and be one of the focal points of your landscape. Below are just a few of the many types and styles of fence services we offer. Now that you have made the decision to have a fence installed on your property, you can choose from the different material types we have listed some of the common types of fence materials used in fence installation by fence installers in Savannah, Pooler, Richmond Hill, Rincon, Guyton and Port Wentworth areas of Georgia. These are some of the most commonly used fence products in Savannah. Savannah is a melting pot of home styles and with this comes our different styles of fence. You can drive around Savannah and see different styles of a fence on every house on a street or block. We have listed just a few of the more common styles of a fence in the Savannah area. Most of these styles can be built with any type of material. Some Homeowners Associations have required homeowners to use same type materials and styles. This also has its benefit, sometimes standards used in the right way can greatly benefit a community. We are able to help with submitting your permits to your HOA and City. Chatham Property Maintenance offers custom built fences throughout Savannah, Pooler, Richmond Hill, Rincon, Guyton and Port Wentworth. Since 2009 we have gained a great amount of knowledge of what works when it comes to wood fences. We have found that fence panels bought at the local big box hardware stores are nowhere near the best quality for the money. So all of our fences are custom built onsite to maximize quality. Do you have broken gates? We also repair fence post and pickets. Do you have a damaged fence? Some fence damage occurs naturally over time and some are premature due to improper installation and practices by local fence contractors. Below is a list of some of the common fence repairs we provide. If you are looking for professional fence installations no matter the size of your project you have found the right company. 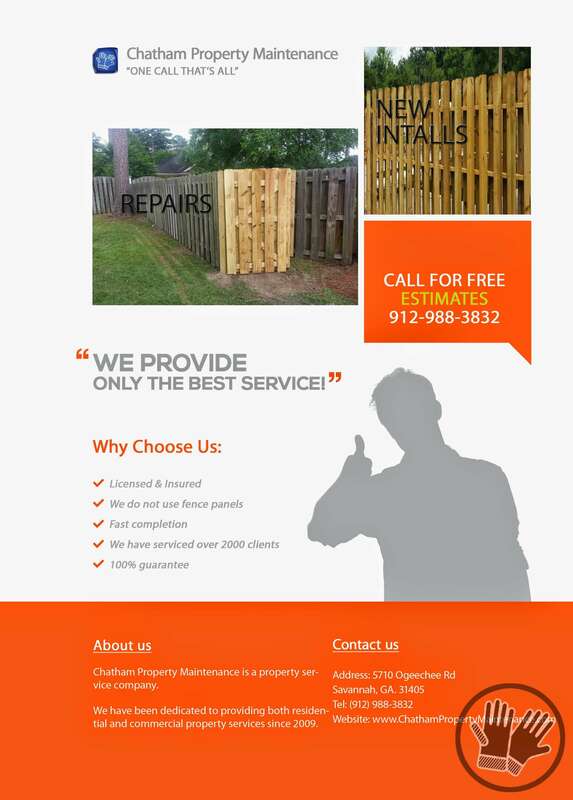 Chatham Property Maintenance is a locally owned and operated fence company located in Savannah. Since 2009 Chatham Property Maintenance has worked hard to provide the best quality fence services to our clients. So no matter your fencing requirements we have the solution. We provide our fence services to the following cities in Georgia and South Carolina. Beaufort | Bloomingdale | Bluffton | Clyo | Coosawhatchie | Dale | Daufuskie Island | Eden | Fripp Island | Garden City | Guyton | Hardeeville | Hilton Head Island | Hunter Aaf | Ladys Island | Lobeco | Meldrim | Midway | Okatie | Parris Island | Pineland | Pooler | Port Royal | Port Wentworth | Richmond Hill | Ridgeland | Rincon | Saint Helena Island | Fence Contractor Savannah Ga | Pooler | Seabrook | Sheldon | Springfield | Thunderbolt | Tillman | Tybee Island | Wilmington Island | Yemassee | Fort Stewart | Hinesville | Statesboro.